New England is includes Maine, New York, New Hampshire, Vermont, Massachusetts, Rhode Island and Connecticut. The New England region is comprised of USDA hardiness zones 3 through 7. With its cold winter and mild summers, New England is one of the most popular areas for planting and growing apple trees in the United States. Measure 20 feet from any power lines, roads or buildings to find a planting space that's an adequate distance from these structures. Mark this minimum distance with chalk. Survey your boundaries and choose a planting site that receives full sunlight. Dig a circular hole 1 foot wider than the root stalk's root ball. Dig the hole deep enough for the graft site to be positioned 2 to 3 inches above the soil line. Remove the bare root's packaging and gently place the roots into the hole. Fill in the hole with layers of peat moss and dirt. Water the apple tree daily during the first two weeks to ensure the roots become established. After that, taper off watering to 5 gallons each week. Watering is not necessary if your New England location receives at least 1 inch of rain per week. Apply a nitrogen fertilizer in a 12-inch circle at the base of the tree two weeks after planting. Water the fertilizer in well for optimum absorption. Do not fertilize after mid-June, as it promotes late season growth and prevents the tree from hardening off for the New England winter. 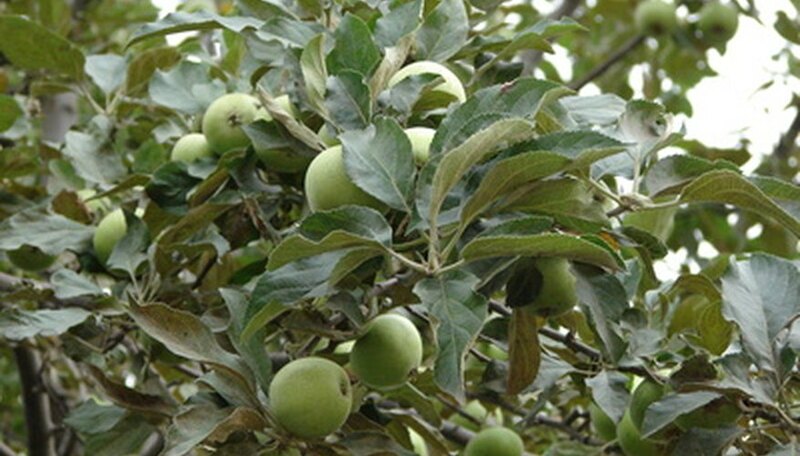 The ideal time for purchasing and planting bare-root apple trees is in April, as the ground has thawed and drained from the winter's snow.